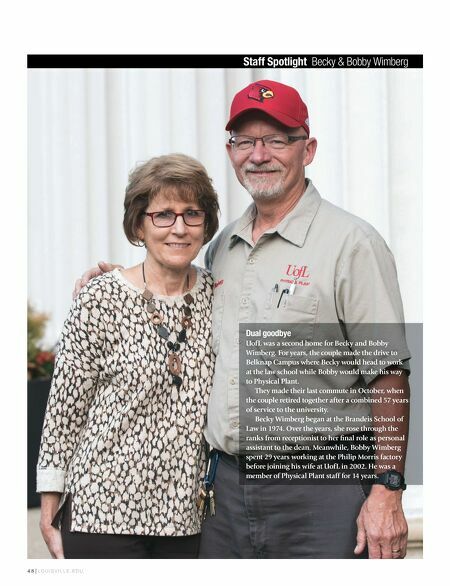 4 8 | L O U I S V I L L E . E D U Staff Spotlight Becky & Bobby Wimberg Dual goodbye UofL was a second home for Becky and Bobby Wimberg. For years, the couple made the drive to Belknap Campus where Becky would head to work at the law school while Bobby would make his way to Physical Plant. They made their last commute in October, when the couple retired together after a combined 57 years of service to the university. Becky Wimberg began at the Brandeis School of Law in 1974. Over the years, she rose through the ranks from receptionist to her fi nal role as personal assistant to the dean. 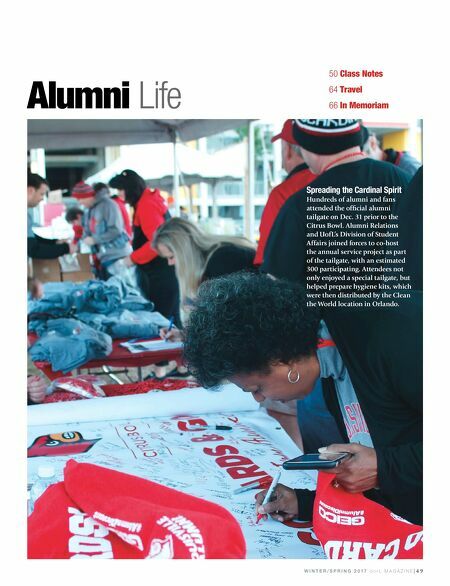 Meanwhile, Bobby Wimberg spent 29 years working at the Philip Morris factory before joining his wife at UofL in 2002. He was a member of Physical Plant staff for 14 years.